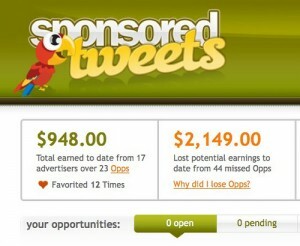 What do Sponsored Tweets Mean for Twitter Users? What do Sponsored Tweets Mean for Twitter Users? You Are Here:Home / Social Media / What do Sponsored Tweets Mean for Twitter Users? MyBroadband reports that you no longer have to be an uber-celebrity, like Charlie Sheen or Kim Kardashian, to earn a couple of bob tweeting about your favourite chocolate or brand of TV. Apparently, Ad Dynamo now allows anyone to sign up and start getting paid for promoted tweets – if they stick to prepared briefs and if they pass the advertisers’ scrutiny. This is fantastic news for marketers. It means that they can increase their social presence and brand awareness ‘naturally’. It’s been proven that social media users tend to believe product reviews from those in their social circle, so products promoted by ordinary folk on the street tend to do quite well. With more ordinary folk promoting products, marketers can expect an upswing in social media interest and, as they ultimately intend, sales. But what does this mean for Twitter users? Twitter has been courting advertising of late, so users have had no choice but resign themselves to promoted tweets in their feeds, even from companies they don’t follow. Now they will be subjected to ‘impartial’ promotions from friends, family and mere acquaintances – anyone looking to turn all their idle hours into a supplemental income. The ‘impartial’ nature of these promotions could also be seriously questioned. You know your friend doesn’t like dark chocolate, but you’ve spotted a tweet in which they sing the praises of a well-known chocolate manufacturer’s new dark chocolate and wasabi flavour. Far from increasing trust, couldn’t this move erode trust not only in brands but in friends’ social intentions? Isn’t there the risk that Twitter will become one big infomercial? Or is this a particularly pessimistic point of view?